No matter the type of your property – flat, house or office building, any renovation like decoration, painting or changing windows, flooring, repairing in the kitchen or bathroom is a process accompanied by the awful accumulation of dust, dirt and other construction waste. Almost everyone has encountered the problem when builders or craftsmen finish their job and leave the care for cleaning after repair behind. The basic cleaning after repair or after new construction is the last but most important step before you move in. We all know that the cleaning requires not only water and towel, but special tools, detergents, machines and a lot of TIME! How much time do you need to clean yourself – a day, two or a week? 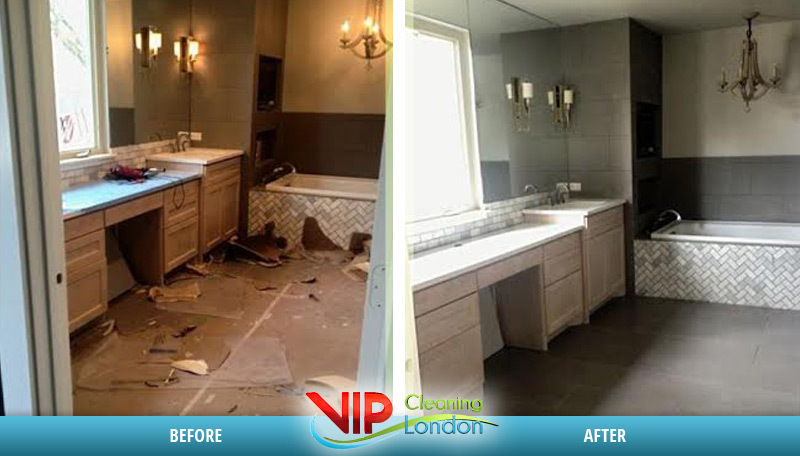 That’s why we from VIP Cleaning offer the service Professional After Builders Cleaning, which will save you a lot of nerves and time, and the final result will be more than what you have imagined. machine cleaning of soft floors and others – deep cleaning of carpets, sofas, mattresses, curtains (treatment of stains and stubborn dirt). washing and polishing of windows and window frames. vacuuming and removing of mites from upholstered furniture, mattresses and carpets. removing stickers, paint, latex from windows. We do a complete cleaning of the rooms “turnkey”! Why to choose VIP CLEANING LONDON? – we use high-end ECO cleaning materials with low or zero side emissions! * In order to clean professionally the refrigerator or freezer it is necessary 48 hours before the cleaning you to turn it off and get out the food and drinks from it. removing the dust and dirt from the top of the walls, ventilation openings, wall protrusions. cleaning the sinks, sanitary faience, toilet bowls, accessories, etc. At your request, we can perform internal cleaning and polishing of drawers and wardrobes but you must inform us in advance. – whether you want complete cleaning. If you want to provide your own detergents and cleaning materials, please contact our associate. Please note that our cleaners do not throw away large garbage or other bulky building material! – the hours of cleaning can be increased to achieve the required result. In case that you still insist your home to be cleaned regardless of the bad condition we will charge you double price! For clients residing in central London, there is an additional CONGESTION CHARGE – £ 12. Securing parking or permits for our service cars is a must. We have logistics centers in the areas listed below. These areas can be serviced as quickly as possible from our staffs.